This whole blog is devoted to R and clean coding in R. But what if you want to start with R? There are millions of websites devoted to learning R. just look at the number of hits on a certain search machine. Most of these hits start with the basics and slowly work your way up to more advanced examples. There is often one reason to start with R: you want to achieve something that doesn’t work in other programs. This is not a dedicated R programming course, there are a gazillion really great courses( see below 1, 2, 3, 4). So I will only show you a few basics, which I think you need. Any specifics can be found in a google search. really, it’s very easy. The goal of these three lessons is to show you how things work, to load a dataset from spss into R and to create a plot. Because plotting is one of the reasons people switch sides and join the R-community. 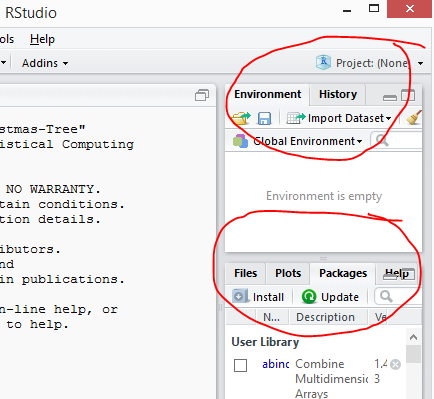 This lesson is about Rstudio, basics, and we will import data from spss. Datamanipulation takes place in lesson 2 and in lesson 3 we will make beautiful plots. The approach is hands on, I want you to do all the things, go through all the motions and start working. Start making mistakes and learn from them. 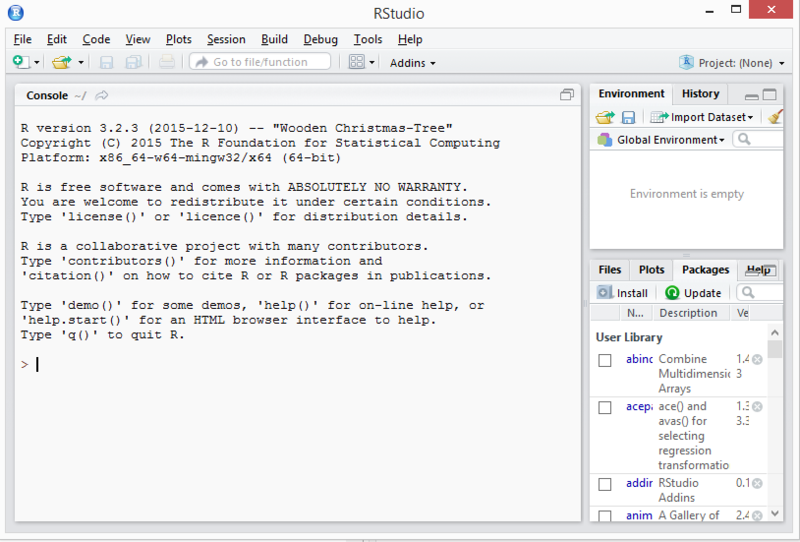 We will first install R and Rstudio. 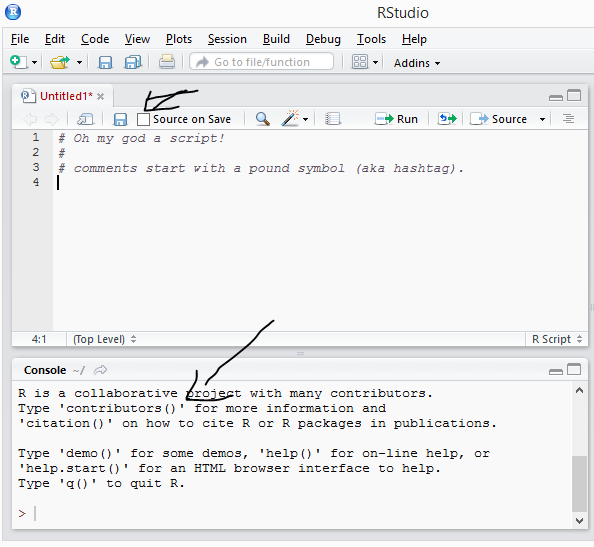 R is the program, and Rstudio is a very useful shell around R. Rstudio helps you organize your scripts and data and helps in codecompletion and a million other things. Furthermore, it looks a bit like spss. You have installed Rstudio, congratulations! You can work interactively in the console (the bottom part in the next picture) and you can work with scripts (in the top part). To simplify your work, you can create functions or scripts that automate stuff. In R this can be taken further. Everyone can make packages that contain useful functions and their documentation. Installed packages can be activated by the code library(name_of_package) . When activated, the functions from that package can be used in your scripts and in the console. 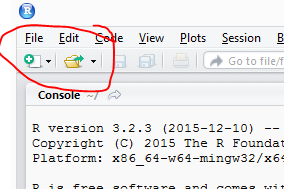 open your version of Rstudio. open a new R script. # Oh my god a script! # comments start with a pound symbol (aka hashtag). # then try line 9 again. execute part of the script by selecting the line with your mouse and pressing ctrl-R or just put the cursor on the line and press ctrl-R.
execute line 9, you will see an error. Why? # do with this script here. The help files give you a description of the function, usage and how the arguments work. And at the bottom are some examples. The help files are often somewhat technical but if you look at the examples (and try them) you will find out how things work. Another great place is the vignettes. Vignettes are long form documentation, often describing every function in the package, practical use, examples and more. But the best advice is this: try google. Really, the R community is huuuuuge! Type your question and somewhere on stackoverflow, r-mailinglists or other websites, someone else has had the same question you have. 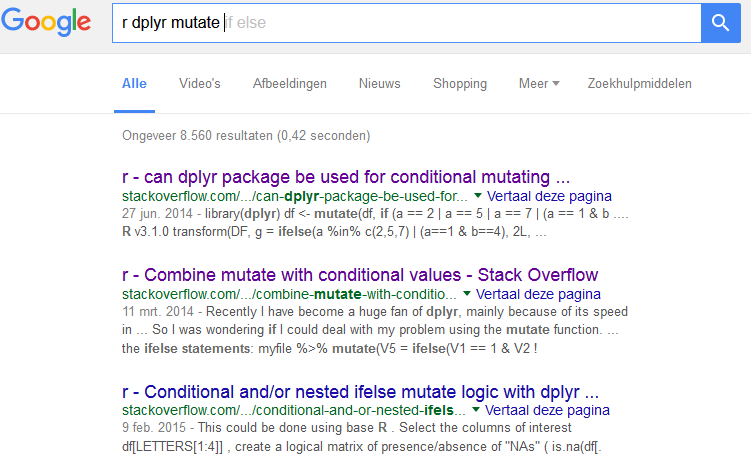 If I need to find out how a function works, I type ?function if I want something else, I search for it online. copy and execute the first 2 lines below. use the View command or click on the blue-grey table icon in the right of the screen. next to df. # and standard normal distributed values. View(df) # or click  next to table on the icon on the right. This opens a view you are familiar with in spss, however you cannot change values here. So data.frames are just like datafiles in spss. Internaly data frames are just lists with vectors of the same length. So what is a vector? Copy the following script and try to find out. df$gp # also try to type this. df$y # will display all the values of the y column. # now look at df again, it has an extra column. # the <- (arrow) assigns values. #  g is a vector. can we add this vector to the dataframe? 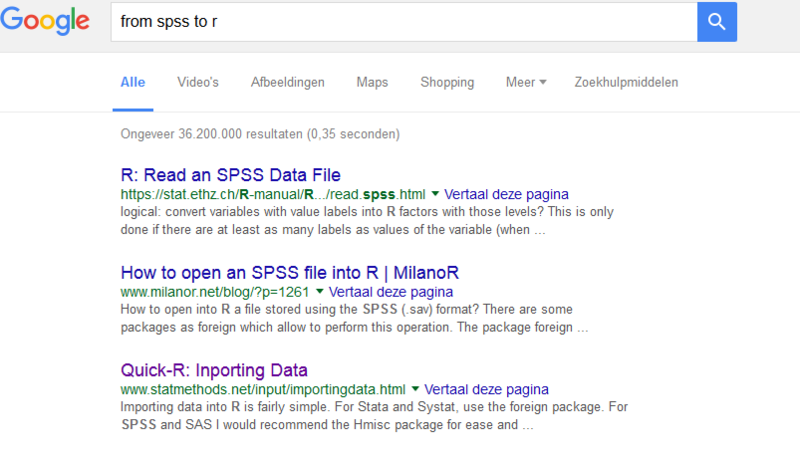 There are multiple packages that import spss files. Many people use the foreign package, but a new one is the haven package. Once installed, activate the package. I will cheat a bit and let you create a .sav file and read it in afterwards, but please try it with other spss files. #your downloads (once you changed it to your settings). # file with "path/to/your/file.sav" instead of file.choose(). The end result is a data.frame with the name df2 which would be identical to df. In the next lesson we will manipulate dataframes, in lesson 3 we will make awesome graphics.